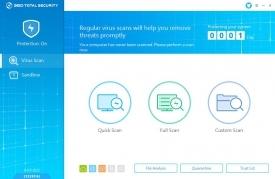 "Keep your PC fast and clean using 360 Total Security." Get complete virus and data protection using an advanced, always up to date anti-virus database only available with 360 Total Security. That's not all though. You can also use the software to speed up and optimize your personal computer so it runs just like it did when you originally bought it. With all of that, you can also free up some hard drive space if you are short on space and need more. Get rid of junk files that your computer leaves behind and does not really need in just a few minutes. With an always up to date anti virus database, you can be sure that the virus scans that you do with 360 Total Security will be thorough and spot viruses that other anti virus software will just not be able to find. With a Full Check, you can quickly check the overall condition of your personal computer and see what needs to be done to free up some hard drive space, wipe away viruses with ease, and speed up your computer. All of this can be done with the software and, with features like this, it is hard to beat. What is even more interesting is, there are actually more features. You can use the privacy protection you remain anonymous over the Internet, make sure you are on a secure Wi-Fi connection, and even make sure that your system is protected from security holes and viruses that you may encourage while using the Internet. The sheer amount of features available with 360 Total Security just simply cannot be found elsewhere and is hard to pass up considering the low price of the software.